When Jor-El questions his grandson's motives for coming on the trip Jon explains that he was struggling with expectations of him as the son of the world's greatest hero. Jor reveals he too is challenged with his role as a grandfather. Both of them exist but in a logical scientific way, they really should not... almost like the stuff of comic books. Jor based his entire life to science and everything he has come to know and experience is detrimental to that. Jon continues his tale and we come to learn it is a co-dependent relationship that Jon and Jor have developed. The two Kryptonians fight villainous aliens across the galaxies and when Jon has the opportunity to return home with two Green Lantern's he realizes he must turn the offer down. For a long time after Jon and Jor continue to travel together but one night a broken Jor bursts into Jon's living quarters telling the boy he is deeply sorry. Before the boy can ask why, the ship is swallowed by a portal and transported to Earth-3. Story - 1: The ideas are clearly there but the execution is, frankly, diabolical. I understand the writer's desire to push for Jon as a hero that is all grown up, but making Lois and Clark out to be gullible, guilt stricken and stupid to facilitate a 'Jump The Shark' is a huge slap in the face to both the creative teams past and your loyal readership. As I said the ideas are all there. The problem is probably best illustrated through Superman's minuscule role in the book. Not one scene is fleshed out. It is all brushed over in poor out-of-character dialogue or some equally painful panels with no dialogue at all. Jon's never before seen, or heard of, struggling being Superman's son. Jor's struggle with mental health issues, realizing only now that he is in a world that defies science - conveniently forgetting his entire life up to Action Comics #1000. Lois' guilt at ignoring her instincts. Superman's rage that seven years of his parenthood has been stolen from him. Jon's holographic arm - it's there, not explained, just there, bizarre. The scene with Killowog and Arisia realizing Jon is alone with a disoriented old man (not notifying Clark or questioning Jon's flaky explanation). Art - 3: The art valiantly tries to fill in the gaps but causes more problems. 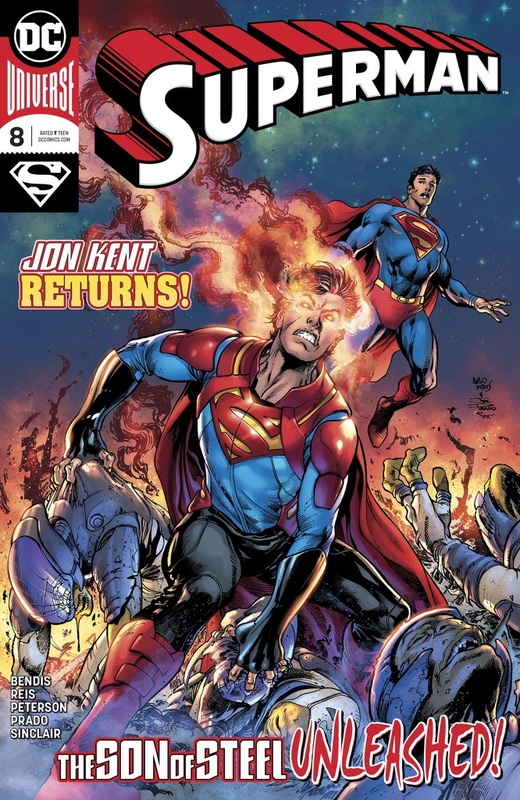 Cover Art - 4: A cool cover showing a very angry Jon, now branded the Son of Steel. The default glowing heat vision present and his holding his own in a fight show Jon as a force to be reckoned with. A nice debut for the teen's arrival back on Earth. I also like Clark's look of shock at his son's personality change. 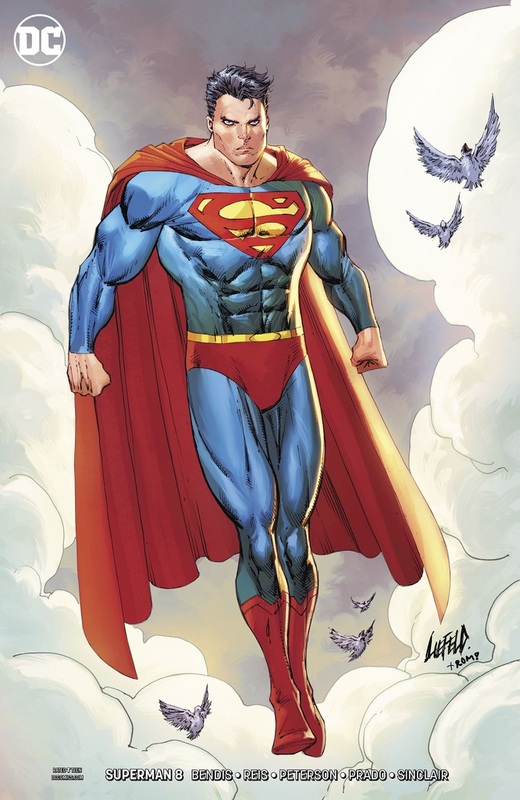 Variant Cover Art - 4: A nice (and rare) rendition of nineties Superman by superstar artist Rob Liefield. There is a determination in his face and stature that I'd like to think was drawn to illustrate the scene where Superman realizes his error in judgement concerning Jor-El.